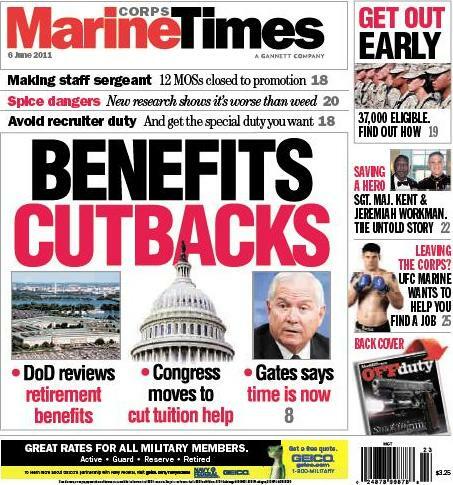 This week’s Marine Corps Times cover story highlights an ongoing debate that could hit service members right where it counts: the wallet. In a trio of stories, Pentagon correspondent Andrew Tilghman explores where cuts could be made to military benefits. Reductions to tuition assistance and pensions are possible, and military officials also are considering a partial pension for those who serve at least 10 years. This week’s newspaper also offers three strong career stories for enlisted Marines. One focuses on promotion opportunities for sergeants, another looks at the Corps’ early-out program, and the third offers tips to Marines seeking their preferred special duty assignment. Finally, we offer up a long-form feature this week exploring the personal relationship of Navy Cross recipient Jeremiah Workman and Sgt. Maj. Carlton Kent, the Corps’ senior enlisted Marine. It’s the kind of story that Marines will hopefully tell again and again. How can we cut military benefits while keeping laws like the Bush tax cuts in place … You watch, the next step will be the reinstatement of the draft. Whose going to volunteer to serve a country that values the greed of a few over the bravery and honor of the many in the military that keep us safe?…it’s such an outrage.